Not to long ago Samsung filed a patent for a Smart Contact Lens. 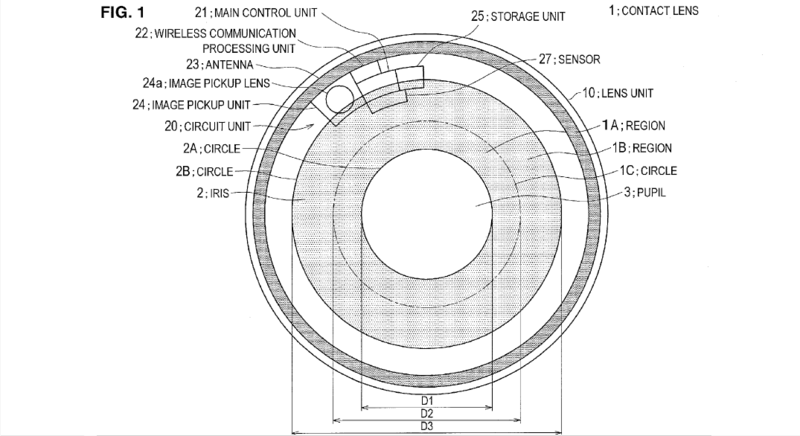 Now we have patent filings from Sony showing they are also working on their own smart lenses. US Patent Filing US20160097940 has a lot of technical jargon and flow charts but the gist of the filing is that Sony wants to create a camera in a contact lens. The camera would have all the features of a regular camera but would be driven by interactions with your eyelids. The flowcharts and the technical documentation reference sensors that would detect your eyelids shutting, but would filter out blinking and other involuntary responses. The lens would also be able to adjust various settings based off the movements of your eye and eyelids. When Google Glass came out there were a lot of concerns about users of Glass invading others privacy. The concerns were valid but because Glass was front and center, and not easily disguised, the concerns never really came to fruition. One thing I found interesting about the patent filing was on page ten, paragraph/section . It specifically states that the lenses are going to be designed to look like colored contact lenses. This brings with it other privacy concerns as those around you may not be aware that you are wearing smart lenses and are carrying around with you a hidden digital camera. Mission Impossible: Ghost protocol, anyone? Either way I am looking forward to seeing the tech when, or if, it comes out. Here’s to the future! You can see the full patent filing here.